Exciting Gift Ideas for Boomers and Retirees – 50 Gifts They Won’t Return! 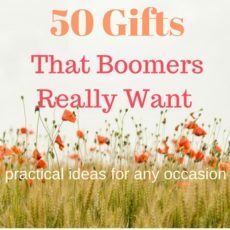 If you’ve been searching for exciting gift ideas for boomers and retirees, I’ve got 50 ideas for gifts they won’t return! Perhaps you’ve got the gift-giving blues because you’re frustrated with trying to come up with a great gift for the boomer in your life. Maybe you think boomers and retirees have been around so long, they already have everything they could possibly want. I’m a boomer and a retiree. I know what boomers want. And I’m here to help. Before I get to my list of exciting gift ideas for boomers and retirees, let’s talk a little bit about what makes boomers tick. Growing older means growing bolder. We are not content to sit on our duffs and watch the world pass us by. For over 60 years, baby boomers have shaped the political and cultural landscape. We’ve been movers and shakers and our baby boomer influence continues to this day. Even if you think it’s unrealistic, we think of ourselves as perpetually youthful and intend to retain our spark as we age. We have bucket lists filled with goals to accomplish, places to see, and skills to master. Exercise is a priority, and many of us use alternative natural health solutions. Baby boomers are taking up new hobbies, exploring the outdoors like never before, and trying new things. Having said that, I hope I’ve made it clear that we couldn’t possibly have everything we want. Every day presents a new opportunity to try something new. Be observant to what the boomer in your life is presently “in to”, and bingo, you’ve got a gift idea! Before selecting a gift, think about the “real” person beneath the persona of Mom, Dad, Husband, Wife, Sister, Brother, Aunt, Uncle – you get the idea. And, let me warn you before I give you my list of exciting gift ideas. Anything that smacks of age-related gifts is a big no-no! Medication management devices or medical alert alarms would be a total insult! 50 Ideas for Gifts that Boomers Really Want and Won’t Return. I’ve broken it down into 25 gift ideas for guys, and 25 gift ideas for gals. All of the items are available through our affiliate program with Amazon, the worldwide merchant we all trust. If you see something you like, please click through from our website. You’ll get Amazon’s great prices, reliable service, and it won’t cost you a single penny extra if you buy it through our site. Although, we will receive a small commission and warm fuzzies in our heart. My husband fully enjoys his trail camera. And we take pleasure in seeing all of the different wildlife that pass through our yard. Hiking poles are very helpful on long and steep trails. My husband never takes a hike without his. Rated 4.6 out of 5 stars, this is Amazon’s Choice for Counter Assault Bear Spray. Best price at $37.89. This is the bear spray we carry when hiking in bear country. A great product any man would want to have as back-up against bears or predators while hunting. Gordini Men’s Da Goose V GTX Mitts. Naturaloft, Gore-Tex, gauntlet Cinch closure. Hands stay warm and dry even sub-zero temperatures. The Survival Series Fire Starter is a must-have for scouting, camping, and hiking expeditions. “I’ve been splitting wood wrong my whole life. Seriously. I should have bought this decades ago. I heat my home with a wood stove. I’m also cheap and buy rounds. They’re cheaper than split wood, and hey, I get a good workout splitting and stacking them. For all my life I’ve used an axe, a wedge, and a 5lb short handle sledge. Over the past summer I somehow lost the sledge somewhere on my 7 acre property. Went here to buy a replacement, and stumbled upon this amazing device. Sure, it is expensive. But I intuitively grasped the implication of its design. It arrived two days ago. It flies through pine rounds like a hot knife through soft butter. It splits hefty rounds with ease. It feels as if I am Gandalf wielding Glamdring. Rounds split asunder like the cheap helms of orcs. It exhorts you to holler like a Viking warrior as you vanquish rounds into firewood. AAAAAARRRRRRGGGHHHHHH!!!!! It is only after you have surrounded yourself with the shards of the vanquished now piled knee deep that you realize that your body is weary, your brow dripping, your breath short, and your body steaming in the chill air – that you realize in a few minutes you have split a month’s worth of heat. You can rest. My sole complaint is that it is TOO EFFECTIVE. it flies through the subject round and has begun to split my sturdy anvil of a very large Ponderosa Pine round I have been using as a base for splitting for years. I may need to place some plywood as a protective layer to preserve it. Well, I think the review says it all. Men love splitting mauls! I know my husband does. He loves the invigorating workout he gets when splitting wood, and says it makes him feel manly. A real winner of a gift for the man on your list that splits wood. “Recieved greenhouse in March 2015. Prepared a level site to place greenhouse in April, I’m 54 and put it up by myself on a sunny, calm day. It took about 7 hours. Very pleased with it. I planned on using it over winter months so I did a lot of extras, I caulked all seams along frame. I also dug 3 ft slots around foundation and buried foam boards in those slots. This was to help with more insulation to keep ground freezing from creeping under. I added some foam strips along door to also aid in insulating for winter months. I have used the greenhouse very heavily thru all the seasons now. Spring for vegie garden seedlings, summer for house plants and flower gardens, fall for herbs and wedding flowers for a September 20th wedding, winter is here and I left a few herbs in to see how they would do. At this time I have Parsley, thyme, rosemary in it and they are doing very well. I plan to add a heater for next winter to grow more delicate greens. We just had our first snowstorm, 31 inches. I live in York County, PA. I was surprised to see that the snow never accumulated more than 3 inches at the most on the roof. The warmness inside kept it melting off which was great, I was worried I would have to clear off snow but never had to. See attached pix. The building behind greenhouse is henhouse and goose house, the snow was so deep we had to clear it off their roofs. I love the auto window opener. It works great. I also added a louver in back side to add more air flow over summer months and a misting unit with a timer I attached to shelves. I used regular garden hoses to attach to rain gutters and ran them in to 5 gal. bucket to collect water. I had cinder blocks that I turned on their side then used 2 x 4s to put on them for shelves. A backyard greenhouse has been on my husband’s wish list for years! This would be a much appreciated gift for anyone that needs to dispose of ashes from a fireplace or wood-burning stove. Three-way coats are waterproof and always a go-to jacket when snow, rain, and winter conditions set in. “Great deal for a great little camera! Bought this for taking pictures in / under the water for a trip to the Philippines and didnt feel like spending hundreds. It certainly has some quirks and a learning curve, but it works great and definitely can’t beat the price! Photo quality is great, would give 4 stars for some of the quirks but gets a bonus star for the great price! – Takes a little time to figure out how to use it since there aren’t many instructions provided. For example, I couldn’t figure out how to open the underwater case and I was afraid of breaking it! See my photos here for help on that. – App recommended in provided instructions didn’t work for me, but another one called PNJ iCam (iOS) works perfectly. So far I have just downloaded and deleted and taken pictures through the app. – Photos and videos sometimes show up out of order on the app, which can make it hard to figure out which ones you have already downloaded vs. which are new. – WiFi functionality for this is similar to what other things like headsets or speakers use Bluetooth for, but since it connects over WiFi, you will not be connected to other WiFi networks during that time. Gifts like this are sure to make anyone smile! I think I might have caught treasure fever from watching that show, I suspect I amore susceptible to Oak Island Treasure Fever as compared to other peoples sine I was born and raised in gorgeous Nova Scotia. Anyways, we live in the desert where there is oodles of space that could be hiding treasures…..what’s under that rock? That sand? That pile of dead cactus? I DID NOT KNOW, because alas I had no treasure stick with which to find treasures. And by treasures I mean metallic objects of great historical and significant value…like bottle caps, shell casings and nails. Rusty nails…yeah. MY rusty nails now. I seriously love this unit, for the price it seems a bit like magic…being able to wave it around over the ground and find hidden metal…I don’t actually need to find ancient coins from treasure hiding peoples, just finding a nickel or a QUARTER woo to the hooo, is plenty satisfying. Plus there’s the whole being out in sunshine, fresh air, beautiful views plus a bit of exercise.I did find a cool old shell casing which led me down a fascinating internet rabbit hole where I discovered a whole world of people who collect shell casings, who knew? I do now. Go exploring and find hidden treasures everywhere! So much fun! Pair these gloves with a splitting maul for a great surprise gift. I wouldn’t normally recommend a tie as a gift, but bolo ties are always welcomed by the man who wants to look dressy and sharp, but dislikes regular ties choking him around the neck. Rated 4.1 out of 5 stars, made in Italy, 100% leather belt, affordable at $28.99. Comes with beautiful gift packaging! “I purchased these snowshoes for a 200+ mile segment of the Continental Divide Trail in the San Juan Mountains. As a thru hiker I used these to their limit and was surprised how well the held up. I would recommend them to anyone needing a cheap pair of snowshoes for a short trip. I used tennis shoes and waterproof socks. – quick release straps make it easy to clip in. I recommend you don’t buy any snowshoe without a quick release strap! Your cold hands will thank you. Lots of men enjoy fishing and intend to do more of it when they retire. Every fisherman wants a fish finder. “Very accurate little unit and well made. It measures within a degree or two for temperature and a few percentage points for humidity of our much more expensive weather station. Keep in mind that the display unit is smaller than it appears in the ad: 3.1 x 2.6 x 1 inches, so you’ll need to put it close by if you want to be able to check it from your chair. Fun gift for the target shooter! My husband keeps his tablet (not a Fire 7) on his nightstand and listens to Youtube videos upon retiring. The only sock my husband wears. Gifts for the hunter who likes to make his own sausage! Great for the prepper on your list! Guys want this because they want to know if it really works. Ha! “I’m a Yoga instructor and I love Gaiam mats because they’re not outrageously expensive, are a good value, and do the job you need them to do. I purchased this in December 2016 and there was NO chemical odor or problem, beyond the initial rubbery scent that dissipated within a few hours. (I’ve never had a smell problem with Gaiam mats and whatever smell other reviewers were encountering seems to have been from an external source and has been solved.) My mat is bright, beautiful, and does everything I need it to do. I have used Gaiam mats for years and am well pleased with them. My Himalayan salt lamp was a much welcomed birthday gift. I keep it in my yoga space and especially love the soft light it produces for meditation. This is not a flowery or overpowering scent. It is very subtle. My daughter remarked that if one was to wear a fragrance, this would be it! As a photographer who owns this camera strap, I can vouch for its superior quality. I am a regular hiker and wear my camera around my neck. The thick, plush strap has made the hiking miles easier on the neck. My tablet cover is baby blue and I paid around $7.00 for it. I am well pleased with it. It makes handling the tablet easier, and the kickstand is great for use on the kitchen counter when looking up recipes for dinner. At first, I used the stylus to type, but now use my thumbs, which is actually much easier. I particularly like the calming effect of lavender. A jacket like this is a must for any cycling enthusiasts, particularly in spring and autumn when temperatures are cooler than summer. Want to see a happy face on a vegetable gardener you know? Buy this! Heron and Cattails Metal Wall Sculpture, Metal Wall Art Home Decor. A unique wall decoration for living room, bedroom, or any other favorite space indoors or outside the home. Very affordable at $89.47. Exquisite craftsmanship. The accent piece that I have lends itself beautifully to my log accent home. Would make a lovely gift. Everyone loves a new pair of warm and cozy socks! Pair this with a unique set of wine glasses and a bottle of wine and you have the perfect gift for the wine lover on your list. Perfect for the wine connoisseur on your list! “This is a very versatile and comfortable pack for traveling light or as a carry-on. The first trip it was used for, it was the only pack carried and had enough room for a five day trip that included fly fishing and going out. The packable shoulder and kidney straps are a very nice touch and the compression straps are great at reducing bulk. There are plenty of zippered pockets for your small items, electronic/business accessories, toiletries and tablets/laptop. The top pocket was great for TSA check items cause of the ease of access and the main compartment has the ability to be locked. Osprey has been my go-to backpack brand for years. The symbol of baby boomers! “Very satisfied with purchase. Product exactly as advertised”. “This bag is amazing! I love that there are no wires to deal with – I just drop my iPhone in. When I get home at night, I set my bag on the charging mat that’s included. It couldn’t be easier! I used to have to stop to find a spot to charge my phone at least once a day, such a pain. I’ve not run out of power once since I started carrying this beauty! It’s the perfect size – large enough to slip my MacBook in, but not so big that it’s cumbersome. Can’t wait to buy the wristlet next! A high-tech tote with fashion! Easily print the pictures you take with your phone! “These headphones are decent for the price. Pros – I like that it is light weight and noise cancelling.